Tag line: "Prepare to explore the universe"
Who better to narrate a space-themed documentary than Mr. Spock himself: the late, great Leonard Nimoy? 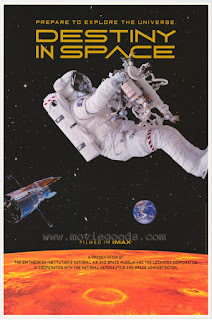 This alone lends an air of authenticity to 1994’s Destiny in Space, an IMAX documentary featuring images shot by astronauts while aboard the space shuttles. Along with its behind-the-scenes footage of the construction and eventual deployment of the Hubble telescope, Destiny in Space contemplates man’s future role in the galaxy, wondering aloud if, and when, we’ll visit other planets in our solar system. In essence a tale of “today” (meaning NASA as it existed in 1994) and “tomorrow”, Destiny in Space tags along on several shuttle missions, studying the crew as they float weightless through the cabin, exercise to stay in shape, and, of course, conduct a series of experiments, most designed to test how people might react to an extended stay in outer space. The bulk of the movie, though, is dedicated to the Hubble, which, after its release into orbit in 1991, was found to have a major flaw in its design. So, three years later, another crew is sent to carry out the repairs, which, as you can imagine, were a little tricky (aside from the limitations of working in space, the Hubble is one of the most expensive pieces of equipment ever assembled, so extra care had to be taken to ensure it wasn’t damaged any further). In addition, Destiny in Space looks years into the future, when man might finally have the capability, as well as the desire, to travel to Venus or Mars, our two closest neighbors, one of which may, with a little work, serve as an off-world colony one day. By way of CGI-enhanced flyovers, Destiny in Space takes us to the surfaces of Venus and Mars, explaining in detail why they’re not hospitable places for man to visit. Of the two, Mars is the most likely to sustain human life, but as the movie points out, we’d have to first master the art of terraforming (adjusting the planet’s atmosphere to make it oxygen-rich), something that would probably take 1,000 years to accomplish. This section of the film has its moments, yet pales in comparison to the scenes where we see the astronauts hard at work on the Hubble telescope (releasing it, then, three years later, fixing it). I also enjoyed hearing about some of the “upcoming projects” NASA was working on in 1994, including a small robot that would explore the surface of Mars, a precursor of “Spirit” and “Opportunity”, which are currently carrying out this very mission (well, “Opportunity” is, anyway; “Spirit” seems to be broken). While only mildly effective as a glimpse of what’s to come, Destiny in Space, now 20+ years out, works pretty darn well as a history lesson.